The Pro-120 and Scoota series controllers have some sophisticated internal power supply circuitry which includes reverse polarity protection, pot fault detection and high pedal lockout. This is a description of the features and of some of the ways that the features can be modified or disabled. The VTX series are very similar, but lack certain features. It is not intended as a do-it-yourself modification guide, more as an aid to understanding of the options and a diagnostic tool in case some of the safety features engage when it is undesirable, or if the controller has been damaged. Referring to the circuit, on the left hand side is shown the 6 way input connector with reverse switch, ignition switch and speed pot. The NCC and VTX series do not possess the power relay, so this section does not apply to them! When the battery is connected (top right, +24v) current flows through the trickle resistor (R1) to charge up the main capacitors (2 off, C1). At this time the ignition switch must be off, disabling the internal circuitry so it draws no current. Similarly no external device (such as a battery condition meter) should be connected to pin 1 of the connector or its current drain will prevent the capacitors charging fully! Once the capacitors are charged, the ignition switch may be closed. On earlier Pro-120, the relay +ve was returned to the main capacitors, after the trickle resistors as shown by LK in the diagram. If the ignition switch is closed prematurely, what happens is down to many variables, but mainly the performance of the power relay. This is an electro-mechanical device, so its actual pull-in voltage is variable from device to device. It will also vary with coil temperature. So the actual charge level required for the relay to pull-in is quite variable. If correct operation is required with the ignition permanently closed, this could be accomplished by fitting an additional trickle resistor in parallel with the existing one. However – also fit a diode in series with the extra resistor, to maintain reverse polarity protection. A 100R 2W resistor should be fine in most cases. From issue 9, an optional diode could be fitted, to feed the relay coil directly from B+ rather than from the main capacitors. There was a series of links to allow various options. On the later Pro-120, these options were (mostly) dropped and the relay feed alone is always via this diode. Feeding the relay thus avoids any powering up problems, at the expense of the possibility of being able to power up the relay even if the MOSFETs have been damaged! Closing the ignition switch turns on Tr3, powering up the current source . This current source applies current to the rail marked 9v1 which rises until the 8v2 zener (ZD1) conducts. The zener current flows into Tr8’s base, turning it on and (on Pro-120 and Scoota only) energising the relay, which shorts out the trickle resistor. You see now why the capacitors must be allowed to charge: if the charge voltage is insufficient, the 9v rail will not rise enough for the zener to conduct, Tr8 won’t have any base current and relay coil will not energise to close the contact. Since the VTX doesn’t have a power relay, there is no relay drive transistor, so a 9v1 zener is used instead of the 8v2, connecting direct to 0v. The internal supply rail in about 9v, the current source is a standard 2 transistor circuit with a 22 ohm resistor (18 ohm on Pro-120) being sensed by a base-emitter, giving about 30mA (nearly 35mA in Pro-120). So the battery voltage minus the 9v causes power to be dissipated in the current source transistor. At 24v, it’s only (24-9) x 30 – or 290mW but at 36v supply, if the zener fails short-circuit (its normal fail safe behaviour) the dissipation rises to 700mW. The transistor used (BC557) has a rated dissipation of 500mW. So the standard VTX circuit is therefore fine up to 36v, but a larger transistor (with suitable heatsink) is required for 48v. The series pass transistor does, of course, get quite hot, especially on 36v and especially when the zener has failed. The Pro-120 (from issue 10) will have about 35mA current source, so a larger transistor is required even on 36v. It used a TO-220 power transistor. However at the instant of switch-on the pot wiper must also be at (or close to) zero or the anode of D7 (connected from the pot wiper, pin 5) will be at a voltage high enough to bring Tr9 into conduction. If this happens, Tr8 will be held off and the circuit will not energise. Once Tr8 has energised, D8 holds the junction of D7 and D8 low so Tr9 cannot conduct. The 100K pull-up resistor may be removed to disable this lockout function. The main benefit of the relay sensing the 9v1 rail in this way is that under virtually any serious fault condition, the relay will not power up. Current sources are very reliable and zeners, under any sort of severe overload, tend to fail short circuit. So it is virtually impossible for the circuit to fail to a situation where the internal rail is permanently live. Any (even transient) external fault that might damage a component will be clamped by the zener and if excessive, will cause the zener to fail short-circuit – a safe condition. On the Pro-120 and Scoota, such a transient overload may blow the relay drive transistor rather than the zener, but such ‘accidents’ cause the base to fail open circuit, so that (although the 9v rail is then high) the power relay cannot operate. Even a MOSFET failure is likely to fail-safe since MOSFETs usually fail gate-body short. 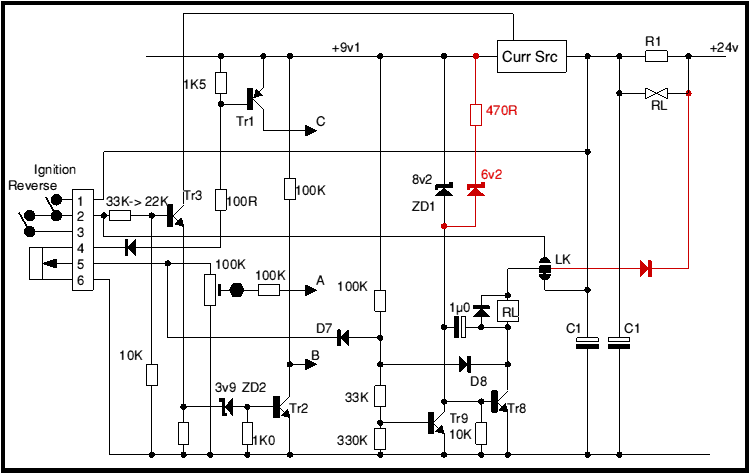 As soon as the shorted gate draws excess current, the 9v rail will drop and the controller switches off and cannot be restarted. Of course the user must not draw excessive current off the 9v line, as might happen if too low a pot resistance were used or external circuity added wrongly. Tr1 is held on, pulling point C high, by current flowing through the 10K pot. If the pot resistance goes high, Tr1 stops conducting and point C drops, preventing any demand speed being available. It is quite permissible to short out the pot – the internal current source is only 30mA, well within the ratings of Tr 1 and the diode in its base. The diode in pin is there to prevent damage by accidents – such as applying 24v to the pot. The 100R resistor is there (on more recent controllers – Pro-120 Mk2 issue 3 and NCC Mk 2 issue 3) because on some occasions the transistor has been blown by shorting the pot to 0v: presumably this is because of the available surge current from the internal 9v line decoupling capacitor (47µ). Tr3’s collector current operates the current source but its emitter current holds Tr2 on. Should the base voltage of Tr3 fall too low, then Tr2 will turn off and its collector voltage will rise. Point B is the input to the dual-ramp reversing clamp and any voltage here will cause the controller to reduce motor speed. In fact pin 3 of the connector is connected effectively across the battery and, since the battery current is chopped at 20kHz (this being the controller’s function) there will be a 20kHz ripple component present on pin 2. The troughs of this ripple will cause Tr2 to turn off if they fall too low. The deepest point of the troughs is dependant on the charge in the battery, the motor current being chopped and (since ohm’s law so dictates) on the length of the battery wiring. So wiring that is too long or too thin can cause the protection to come in earlier than it should, limiting maximum motor current. The effect of this protection is to reduce the available peak current as the battery discharge, making a flat battery appear to go flatter rather faster than it otherwise would! This prevents over-discharge. With issue 9 Pro-120, the undervoltage cutback point was reduced by lowering the original value of the 33K to 22K resistor to the base of Tr3. With 33K the cutback point was around 19v which was too high. 22K reduces this to around 15v, essentially disabling cutback. Below about 15v there is danger of the relays dropping out. This gives the option of an externally programmable undervoltage cutback level! A 0-10K pot in series with the ignition input will adjust the threshold between approximately 16v and 21v: see instructions. For manufacturers, it gives the option of a concealed switch to disable the undervoltage cutback. Thus, when a customer phones you and reports problems which you diagnose as failing battery, you can tell him to switch out the undervoltage protection to get a bit more battery life. It will therefore prime the user to the fact that he’s going to have to shell out for a new set of batteries! This powering up scheme means that you cannot hard-wire the ignition and then expect the controller to power up when you connect the batteries! Some controllers will, some won’t, it depends on the characteristics of the individual relay. So there is also present a link marked LK on the circuit. This is a changeover link which, when unlinked and relinked, disconnects the relay coil from the main capacitor (internal 24v line) and reconnects it to pin 2, the ignition pin. If pin 2 is now fed from +24v input (the battery positive line) direct (and not from C1 via pin 1) then the trickle resistor is bypassed and the ignition switch may be hard-wired without causing the controller problems when the controller powers up. Be aware that this may remove the reverse polarity protection. From issue 9, an additional option (factory set) will be available): an extra diode can be fitted (shown in red on the circuit) so that the power relay coil will power up from the battery input, via the diode, rather than from the internal main capacitor line. This scheme suits some industrial users better as the ignition can then be made before applying battery and the controller will power up when the 9v rail comes up, independent of the charge on the main capacitor. With either scheme, since the relay can power up before the main capacitors have charged, there is likely to be some arcing at the relay contacts: this can shorten the relay life! This link is not easily accessible and this option must therefore be selected during manufacture! It should also be noted that these options will normally only be used when the High Pedal Lockout is disabled. 12v is quite close to 9v. It is quite easy for a sudden current surge to cause a drop of more than 3v in battery and wiring – don’t forget that the peak current from the Pro-120 is typically 150 amps. If such a voltage drop happens then the internal 9v rail will drop and the controller will switch off. The best solution is to use a large enough battery, short wires and if necessary double up on the battery wires. Better still – go for 24v. If the internal supply voltage drops out of stabilization then the controller certainly isn’t working properly so there is indeed a fault! However, recent 12v Pros have had an extra zener diode and resistor added as show in red on the circuit above. This keeps the relay held in even though the 9v rail does drop a bit, because base current for the relay drive transistor still flows through the 6v2 zener. This stops the relay dropping out, so stops working controllers being returned to the factory, but does not cure the fault, only the symptoms! The drawing above (of an issue 7 board, but issues 4, 5 and 6 are very similar) shows where to connect the zener and resistor. Point A (north end of a 100K resistor, colour code brown-black-yellow) is the +9v1 rail and point B is the base of the relay drive transistor, Tr8. If you are experienced enough to do this mod safely, this information and the circuit diagram will be adequate, so if it is not – contact 4QD!